Coping with recent loss of my son! 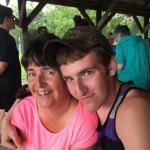 I just lost my son 9 weeks ago in a horrible motorcycle accident. He was 5 weeks shy of his 22nd birthday. He was an athlete and played football, basketball, baseball and ran track when he was in high school. He graduated as an automotive technician and was hired at a big car dealer and worked there full time and finished his degree. I have had a horrible time coping with his loss. My husband and I grieve differently so that is added stress. I cry and look at pictures and talk about AJ. My husband cannot do that it tears him up. We are working hard to help each other cope but it is really hard when our coping is so different. I also have a 15 year old daughter that is trying to cope too. I don't feel as though I am handling anything very well. I just went back to work as a preschool teacher and need help learning to cope! My heart goes out to you. Accepting the loss of my daughter is perhaps the hardest thing I have ever had to do. Even more so than the loss of my husband the year before. She has been gone for 3 years and yet I still see her sitting on her porch watching her horses. Perhaps that is my idea of acceptance. I hope you have a local support group nearby. It may be helpful to meet with others who understand exactly what you are feeling as many of us here do. I am so sorry, it has to be the hardest thing in the world. I haven't lost my kids, but lost my husband 12 years ago, both parents, and many friends. No one expects to lose their child and I would think it would just add to the pain to feel their life was cut too short, I know I felt that way about my husband. People do grieve differently, I'm glad you recognize that and you are both allowing each other those differences, but still realize you're in this together as a family. You might want to try a professional grief counselor and/or a grief support group. It can be so hard to navigate your way through grief on your own. There are a ton of articles and helps here, you might want to explore this site, not only the forum. Feel free to come here, it does help to express yourself and we're here listening. I don't feel as though I am handling anything very well. I just went back to work as a preschool teacher and need help learning to cope! How does one "handle anything very well" under the circumstances you describe, Bree? My heart goes out to you at the tragic loss of your son, and I hope you will take to heart the wise advice that Karen and Kay have given you. Grief leaves us feeling so powerless ~ and I firmly believe that knowledge is power. The more we know about what is normal in grief, the better prepared we are to understand it and learn how to deal with it. I went back to work two weeks after my husband died, even coming in five days after he died to do the payroll. It was very difficult. It was hard to think, I had brain fog, I made mistakes (and this in a job where mistakes were not allowed). I talked to my boss and asked him to check my work for a while because I felt I couldn't trust myself to do the job correctly, it was weird. I was fortunate to have a place where they were so compassionate and understanding, and my boss had someone who had suffered loss of a child talk to the employees before I returned. He briefed them on what to expect and how to handle it, and I still appreciate that kindness. If I suddenly erupted into tears and ran into the bathroom for cover, they understood that that was normal and allowed me that. No one ever suggested I needed to "get over it" or anything of the like that I hear others talk about. I hope your workforce is also compassionate and understanding.